The fragmented nature of the Greek city-states initially limited the frequency and duration of campaigns during the ancient era. The Greco-Persian wars eventually caused an evolution of Greek warfare with the alliances formed between city-states allowing battles to take place on a greater scale. By the time of the Peloponnesian War, Athens and Sparta had developed as powers, leading to improved strategies and naval warfare. At Buying a Sword, we are pleased to provide excellent Greek swords modeled on historical hoplite sword designs like the falcata and kopis. Our Spartan swords include several designs from the movie 300 and its sequel. 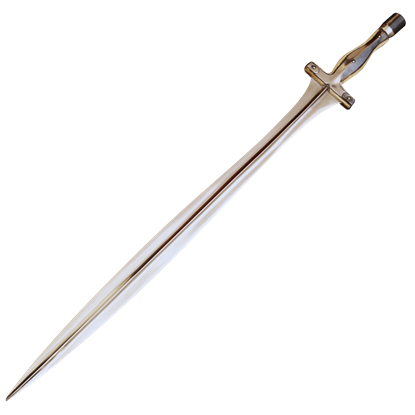 In addition to Spartan blades, we offer various Trojan swords and Macedonian swords like a replica of the one wielded by Alexander the Great. 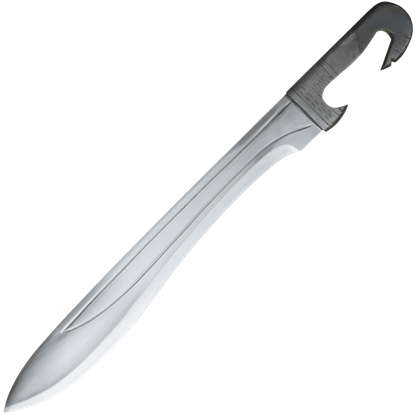 Our selection includes both functional Greek swords and decorative Greek swords, ensuring that we carry pieces suitable for reenactors, collectors, and performers. Hailing from Sparta were some of the foremost warriors in the ancient world. Brutal and efficient, the Spartans were a military power without equal, thanks in part to their weapons, one of which is the Antiquated Spartan Sword. In the ancient realm, the Hoplite was one of the most feared warriors of Greek descent, inspiring fear with every stroke of a sword. Now, you can echo his powerful might by wielding a weapon like his own, the Black Greek Hoplite Sword. Hailing from Sparta were some of the foremost warriors in the ancient world. 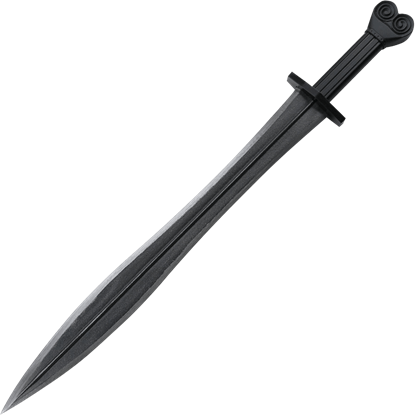 Brutal and efficient, the Spartans were a military power without equal, thanks in part to their weapons, one of which is the Black Spartan Warrior Sword. The leaf shaped blade was quite popular throughout the ancient world. 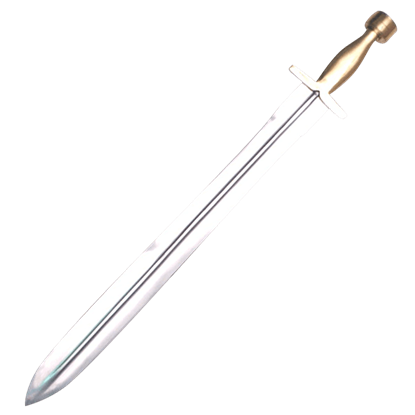 Our Hoplite Sword features a steel guard and pommel with a wooden grip covered with leather. The high carbon steel blade makes this sword ideal for re-enactments. The xiphos was not the only sword of the ancient Greeks. 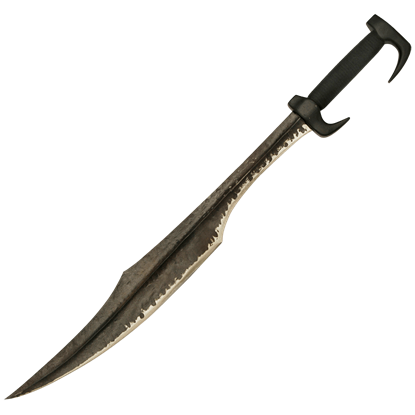 They also favored the kopis, a remarkable blade that had the speed of a sword and the weight of an axe. 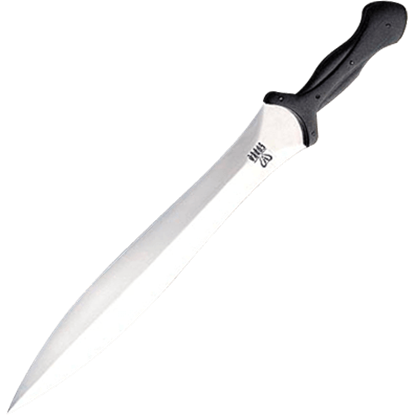 That design has been recreated for you today in this Cobra Steel Kopis. 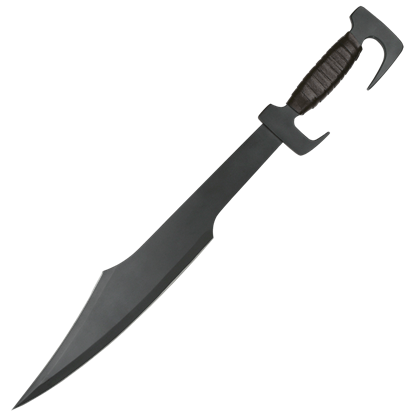 Named after the region of Greece where Sparta was located, the Cobra Steel Lakonia is a short sword that is modeled after the xiphos, a Greek sword. The Lakonia is short, because it brought Spartans one step closer to their enemies. Hailing from Sparta were some of the foremost warriors in the ancient world. 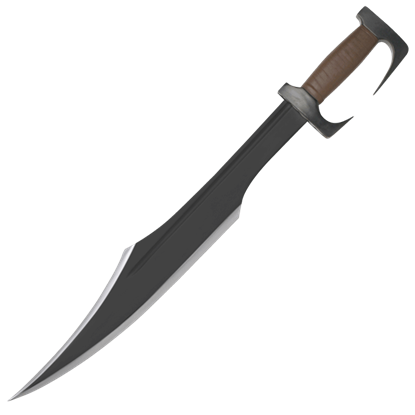 Brutal and efficient, the Spartans were a military power without equal, thanks in part to their weapons, one of which is the Dark Spartan Sword. When a Greek soldier, known as a Hoplite, marched into battle, they favored group tactics, using javelins to soften their foes from afar before switching to a sword, likely this Grecian Straight Sword, to use when fighting. 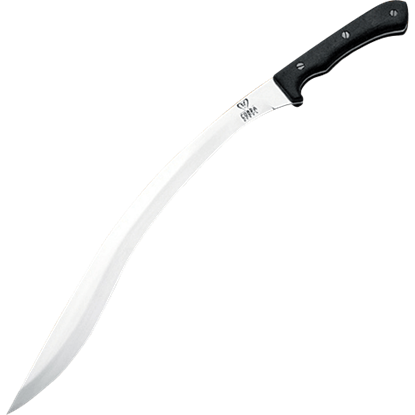 The inward curving blade on the Falcata delivers a tremendous blow and could split both shield and helmet. This sword is considered to be of Greek, or possibly Etruscan origin, its use spread into Southern Russia and also Spain. While curved swords might have been used by the Greeks for their cutting power, oftentimes Greek hoplites and warriors were equipped with a straight sword, like the Greek Sword, because of its martial effectiveness and reliability. 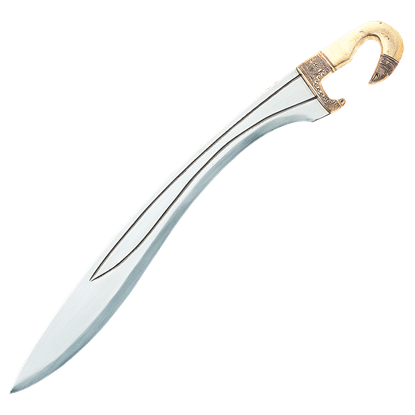 While curved swords might have been used by the Greeks for their cutting power, oftentimes Greek warriors were equipped with a straight sword, like the Greek Sword with Bone Handle, because of its effectiveness and martial reliability.